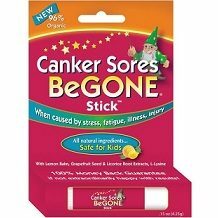 Robin Barr Enterprises Canker Sores BeGone Review - Does it Work? Our review focuses on an organic lip balm stick for canker sores, Canker Sores BeGone. It is designed to heal canker sores within 1 to 3 days, greatly reducing the normal time it takes for these inconvenient mouth lacerations to disappear. 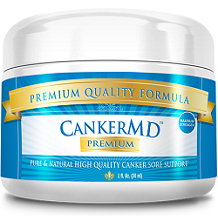 Canker Sores Begone relies on a plant and herbal formula. It rids the mouth of these burning, often painful cut-like sores which can make eating, drinking and even speaking difficult. Most of the time, you do not need to treat canker sores. They can heal on their own, but in a longer time frame. Canker sores are small ulcer-like abrasions on the tongue, and the inside of the cheeks and mouth, lips and throat. They may be caused by stress, spicy foods, dental work, exhaustion, vitamin deficiencies, hormonal changes and autoimmune disorders. These sores are not the same as cold sores or fever blisters. The latter is triggered by a herpes virus infection. The last three ingredients are natural but not organic, although the rest of the ingredients are. All these ingredients have soothing, restorative and antifungal properties. The addition of Beeswax is great. This creates a seal or protective barrier to protect the rest of the ingredients, allowing them to work for longer. L-Lysine is a powerful protein component that is also used to treat cold sores and other skin lacerations. This balm, as stated by the manufacturer, does not help when acidic foods have caused the canker sore. Interestingly, vitamin-rich aloe vera is absent from this formula. Also absent are direct sources of Vitamin B12, which help prevent future outbreaks. Dab some of the balm stick ingredients to your fingertip, and then on to the canker sore. Repeat this a few times a day. There may be a slight stinging sensation at first. The product is safe for children and adults. This natural product is not known to cause any side effects. It is non-addictive. Overdosing is unlikely due to the small quantities being applied to the inside of the mouth. The lip balm stick can be bought for $3.50 online if you are in the US. It is $13.50 to ship it to outside of the US. You can return the stick for a full refund should it not be effective, but the exact time frame within which the guarantee remains valid isn’t clear. The balm looks to be an effective remedy for canker sores. It is not expensive, and we like the balm formula which seal the active ingredients against saliva so they can work for longer. Most people find that it does reduce the healing time for canker sores and that the taste is not repugnant. Another plus is that it is safe for everyone to use. The drawback is that if your laceration is due to acidic foods such as lemons or oranges, your sore won’t heal by using Canker Sores BeGone. Try another product if this is the case.